Born in Hanau am Main, Germany, in 1943, Rolf Rafflewski began to paint at the age of 12. His first one-person exhibit was held just four years later. 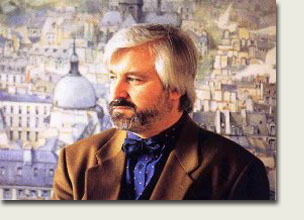 At the completion of his art studies at the Staatliche Zeichenakademie in 1961, Rafflewski visited Paris, fell in love with the city and moved there permanently. Paris - the elegant boulevards, lively quais and winding streets of Montmartre - provides the subject for many of his paintings and lithographs. Over the past twenty years Rafflewski has exhibited actively in galleries and museums throughout the world including San Francisco, Washington, Tokyo, Hawaii, Paris and New York. In addition to his many exhibitions, Rafflewski is known to collectors for the one hundred limited-edition lithographs he has created. In 1973, the Bibliotheque Nationale in Paris honored Rafflewski with a one-person exhibit. Moved to France at an early age; first one-man show in Paris at the age of nineteen. Known for his peaceful, harmoneous, romantic landscapes.